This tencel is imported from Canada and dyed in my Oregon Studio. It is made by pulping hard wood into a slurry and extruding it through a chemical which hardens the fibers so they can be gathered and spun into yarns. The chemical is then filtered and reused. The wood is from junk trees that grow in poor soil with very little water and is considered an environmentally friendly product. Skeins are 4 oz. or 525 yds. Each skein will make a warp for a scarf of about 8" x 80" or will knit a scarf of the same size. Suggested knitting needle size is a size 4. Sett for slightly warp faced twill is 24 epi with a 10/2 weft yarn of tencel, rayon, cotton or silk. 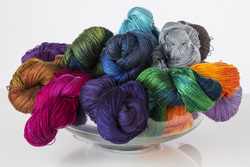 Skeins are 4 oz. or 1040 yds. Each skein will make a warp for a scarf of about 8" x 80" or will knit a scarf of the same size. Suggested knitting needle size is a size 0-1. Sett for slightly warp faced twill is 36 epi with a 10/2 weft yarn of tencel, rayon, cotton or silk. Skeins are 4 oz. or 312 yds. (sport/dk weight). Each skein will make a warp for a scarf of about 8" x 80" or will knit a scarf of the same size. Sett for slightly warp faced twill is 15 epi Plain weave or 18 epi twill with a 5/2 weft yarn of tencel, rayon, cotton or silk. This is a sampling of the dyed yarns that I have available in stores. Please check the big cartel site to see individual yarn types and colors to see what can be ordered on line which are different from the colors carried by stores. To purchase yarns please see list of stores that carry my yarns with subgrouping by state.